If you are using 2 NAS server for storing and sharing data with each other, 2 NAS server synchronization should be the best way. Here will introduce you how to sync two NAS servers. NAS server is a means for storing your data on computer network which can be accessible by more than one computer. And the NAS server is popular in home users and small companies. They can deliver much more than basic file sharing. That’s why users want to use a NAS server. For getting a NAS server, you can install a NAS device directly, or you can build a NAS Server by your own. The truth is the small companies always hold 2 NAS servers, and they want the 2 NAS server synchronization. Sync two NAS server will provide more convenience for users. For example, you have two NAS devices, device1 is for your home and device2 is for your office network. However, you may want to sue the data on device2 when you at home, or you need use the data on device1 in office. and you use both for storing your data. for 2 NAS server synchronization, the AOMEI Backupper Standard is highly recommended for Windows users. 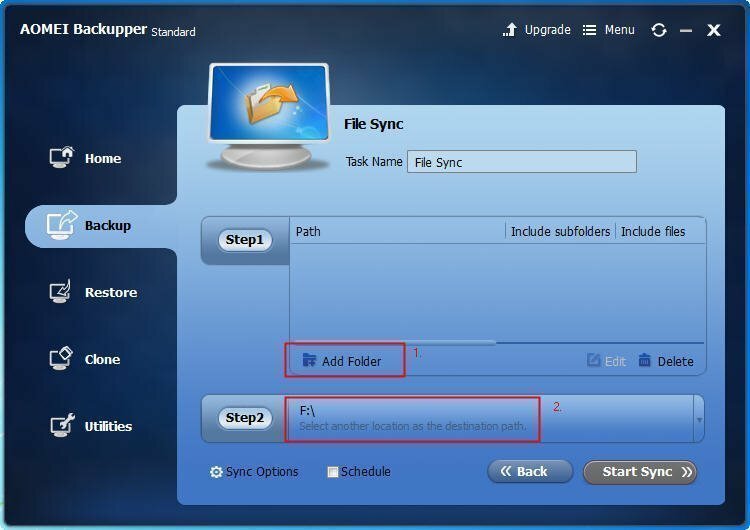 Sync in AOMEI Backupper is a great function that can synchronize files and folders automatically with a schedule to local disks, external hard drives, portable USB flash drives, NAS or network shared folders. It enables you to sync multiple pairs of folders or files so that you can easy and quick update two folders in two different place. Thus, it could be the best choice for your 2 NAS server synchronization. How to sync two NAS server with AOMEI Backupper? AOMEI Backupper will help you sync two NAS servers with simple steps. 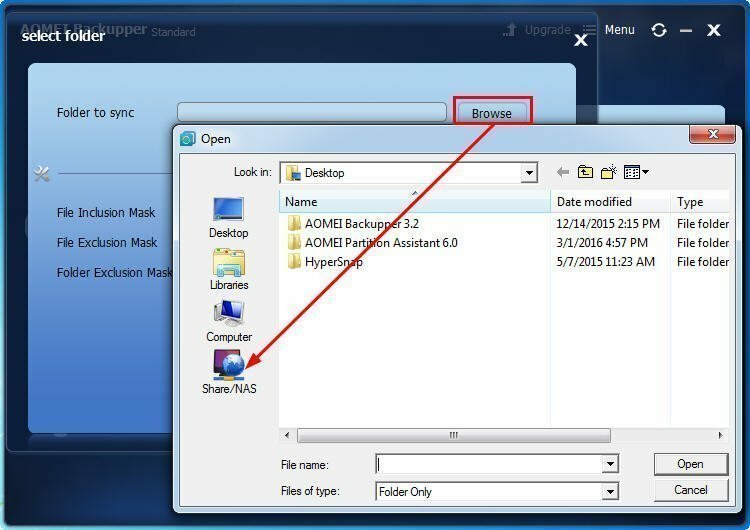 Before you do, you should remember the IP addresses of your two NAS servers, then, download the AOMEI Backupper standard free if you are using Windows PC, including Windows XP/Vista/7/8/10. Step1. 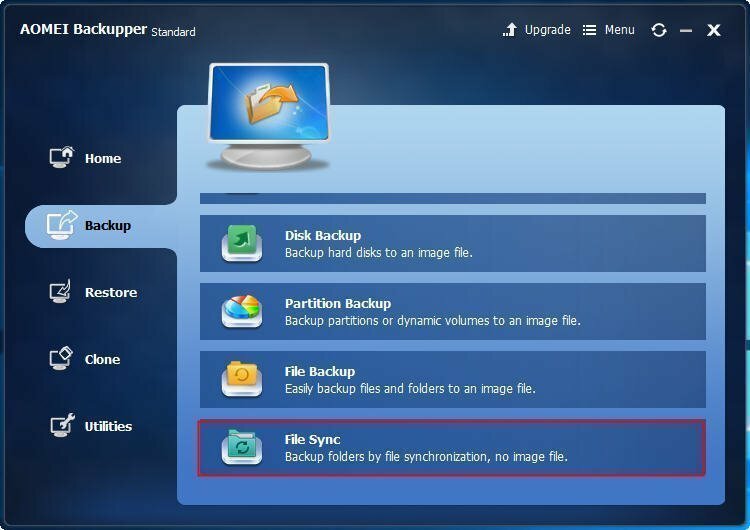 Install and launch AOMEI Backupper Standard, click Backup-> File Sync. ● Click Add Folder in the page, then, click Browse in the pop out window. Then, choose Share/NAS. 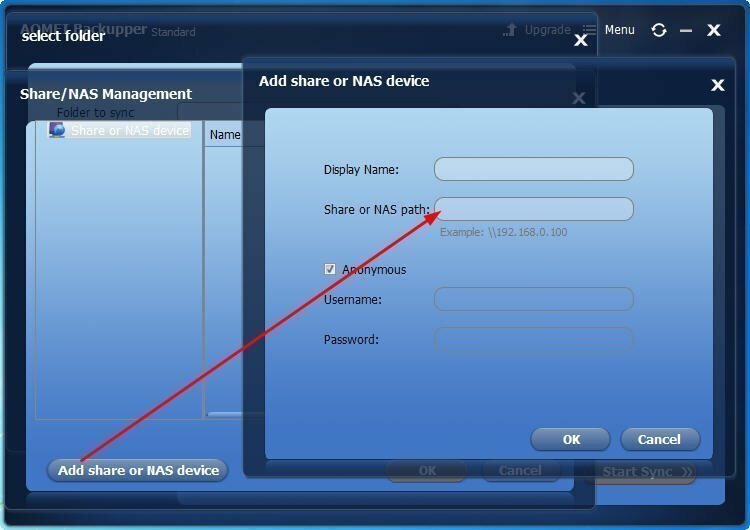 ● It will pop out a window Share/NAS Management, click Add Share or NAS device, and input the NAS name or its IP address (recommended). You may be required for inputting username and password. In a word, input all the information, click OK to move on. 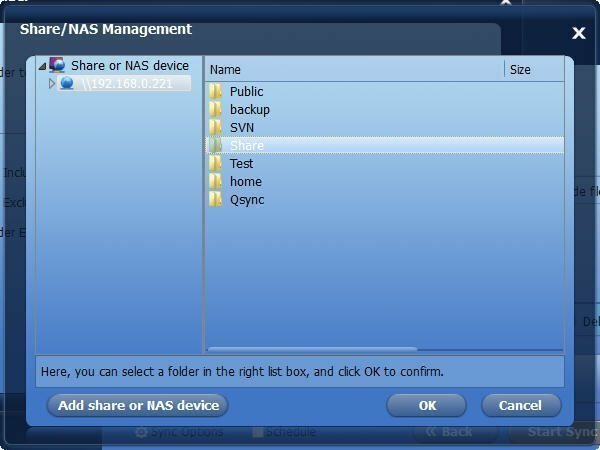 ● When you connect the NAS device, click it, and all the folders will be listed in the box, select the folder you want to sync to another NAS device and click OK.
● Then, you should click “Step2”(marked as red 2.) to select another NAS device as the destination place. And all the specific steps are same as Step2. Step3.Here you have already prepared for the two NAS server synchronization. you can set an automatic synchronization with daily, weekly, monthly or event triggersfor this task by using Schedule, and you can set up more with Sync Options. Finally, click Start Sync to launch the progress. With AOMEI Backupper, sync two NAS Servers will be easier and simpler. Besides synchronizing two NAS server, AOMEI Backupper supports you sync files between two computers, backup NAS to NAS, backup PC to NAS, etc. It does really a powerful software for keeping your data safe.